Cathy (Fast Fingers) Welsford & Angie (Random Chords) Smith, have performed together for 30 yrs, singing their way through numerous political upheavals, cultural revolutions & against injustice! 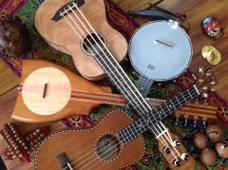 They offer us two workshops & will play a couple of tunes over supper afterwards. Workshop 1 - 6:30pm for intermediate players who can read tab. 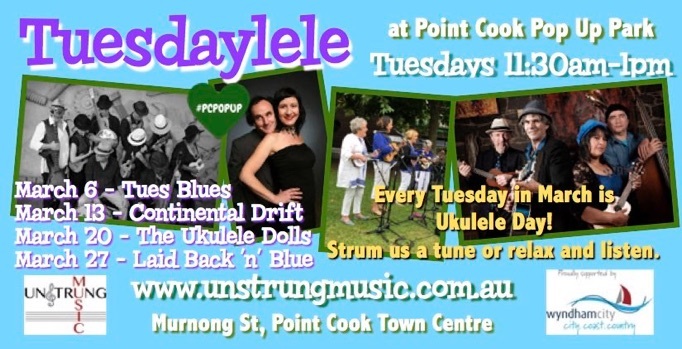 Workshop 2 - 7:30 for absolutely anyone who plays the ukulele. The Hive - Werribee Bowls Club. 239 Watton Street, Werribee. There is ample parking. Look for the outdoor public swimming pool next door. 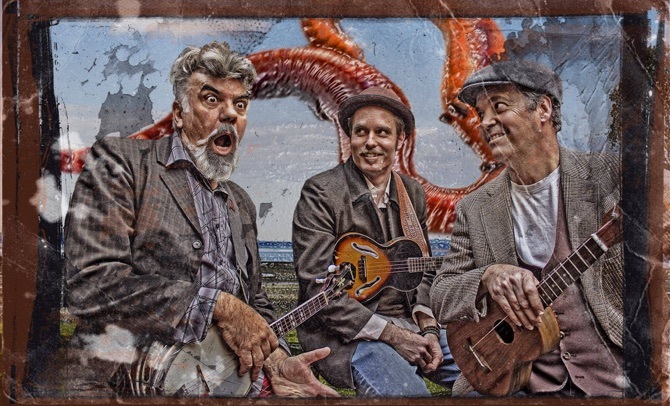 The Nukes are a fabulous ukulele trio from New Zealand. They have captured audiences with their quirky live shows full of harmonies, fun original songs and impressive ukulele playing. First up, there is an hour long workshop on offer. Limited places! All levels. BYO ukulele! their third beautiful album, THE NUKES III. You will be thoroughly entertained! and then never learn to play? Made a New Year’s Resolution? We’ll teach you how to play them. All ages welcome. No Bookings, just come along! $10. 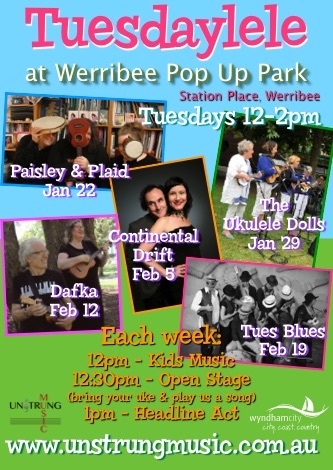 Come and listen to some great music by ukulele artists all from Melbourne’s West. 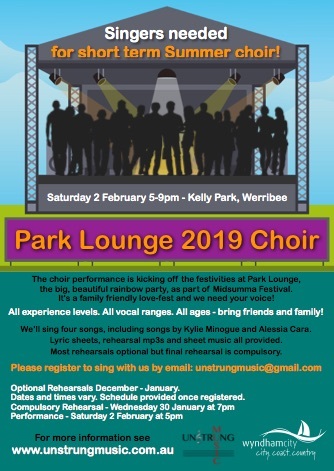 Also hear some fun, budding ukulele groups and even bring your own uke along and step up to the mic and play us a song or two. From time to time run events or we have guest artists teach workshops or perform. Like our facebook page for announcements. 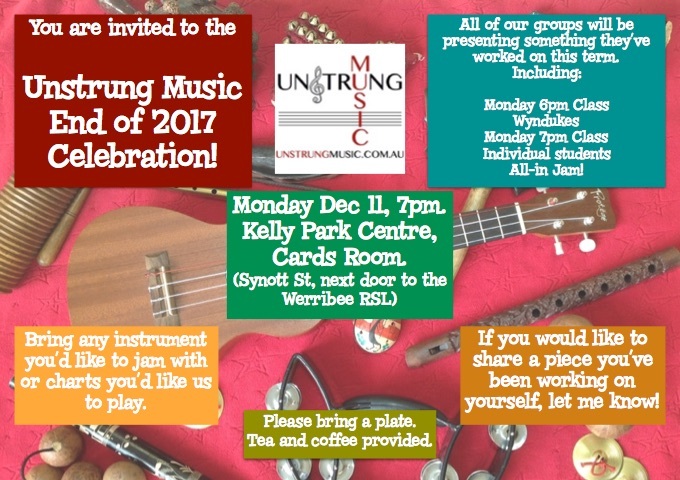 We have a concert in Werribee with a special guest performer and all of the Unstrung Music Ensembles performing. Details are currently being finalised.